Assessment 1’’ book. 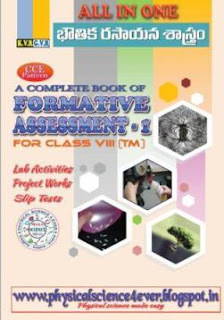 We will try to give you a complete ALL IN ONE, A Complete Book ofFormative Assessments for F.A 2, F.A 3 and F.A 4. Working towards improving the children's learning through observing and recording their performance, while they are participating in teaching learning processes like project works, lab activities, slip tests, etc., is called Formative Assessment. It is used by the teacher to continuous observe children's progress in a non-formal way and in supportive environment. It gives regular descriptive feedback, rather than marks and grades, which give a chance for the students to reflect on their performance, Take advice and improve upon it. know in detail inside pages. this opportunity to help you in the view PHYSICAL SCIENCE, what we like. This book is only for the private use. No one should use this for commercial proposes. Activities and Projects in the FA 1 syllabus.